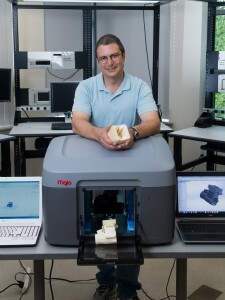 Northern Essex Community College Engineering Professor Jim Cahaly is excited about how the college’s new 3D printer will enhance learning for students in Computer Aided Design (CAD) courses. “We have been working most of this summer on developing student projects to integrate this new technology into our core Engineering curriculum,” said Cahaly. One project may be asking students, most of whom are engineering majors, to design their own cell phone or USB case, using Solidworks, a solid modeling design software package which is an industry standard, and then print out the actual design on the 3D printer. Another project would focus on “reverse engineering” where students are given a detailed design of a complex object made up of several components with mistakes, which they are asked to find and correct. When the pieces are printed, it will soon be obvious whether they found the errors. While 3D printing and related technologies—which builds objects by applying plastic material in successive layers, each layer just slightly thicker than a human hair— is more than 25 years old, the technology only recently became more affordable. 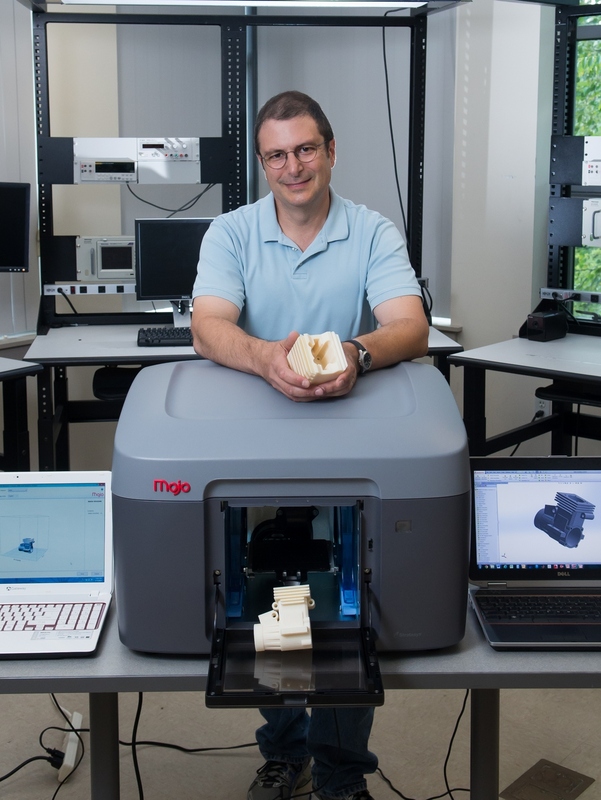 The college’s commercial grade 3D printer was purchased with an $11,000 grant from the college’s Perkins allocation, federal funds administered through the Massachusetts Department of Elementary and Secondary Education. Housed on the Haverhill Campus, it will be used by students taking CAD courses, which are offered as part of the college’s engineering curriculum and Computer Aided Design (CAD) certificate. The applications for 3D printing are many, according to Amit Chowdhry of Forbes Magazine, who writes that 3D printing has been used to create car parts, smartphone cases, fashion accessories, medical equipment and artificial organs. Using NECC’s new printer, Cahaly recently printed a two-stroke model engine block and heat sink that he modeled on his laptop computer. Each part, which was the size of a small digital camera, took almost a day to print. 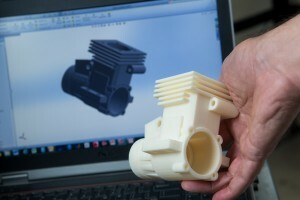 Using NECC’s new printer, Cahaly recently printed a two-stroke model engine block and heat sink that he modeled on his laptop computer. Each part, which was the size of a small digital camera, took almost a day to print. When the piece comes from the printer, it’s encased in protective support material which is water soluble. After being immersed in a water tank for several hours, the protective support material dissolves away leaving a clean part. NECC’s printer is designed to use ABS plastic which is both tough and durable. The college also installed a 3D printer at the Lawrence Campus that will be used by Computer Science students. A different kind of printer, the Lawrence machine will help computer science students learn how to program a 3D printer. NECC offers associate degrees in electronic technology, electronic technology: computer systems, and engineering science and certificates in computer aided drafting and electronic equipment technology as well as three associate degrees and seven certificates in computer & information sciences. For more information visit the website, http://www.necc.mass.edu/academics/courses-programs/areas/technology-engineering/.